The Mississippi Riverwalk is a 1/2 mile walkway atop Dubuque's flood wall at the Port of Dubuque. It offers spectacular views of the Mississippi River, rail and road bridges, and Dubuque's downtown. At the north end is the Star Brewery building, which houses Stone Cliff Winery and is fronted by a large amphitheater. From there you can cross under the railroad abutment, and ascend back up to the levee for more views, including Dubuque's Shot Tower (see Landmarks), and some interesting barge docking and loading activity. If you are interested in painting excursion boats, the Riverwalk is the center of excursion boat activity in Dubuque. Information about excursion boat touring, including docking schedules for larger boats can be found HERE. The Twilight is shown docked in Dubuque above. Restrooms: At hotel (center of riverwalk) and winery (north end). 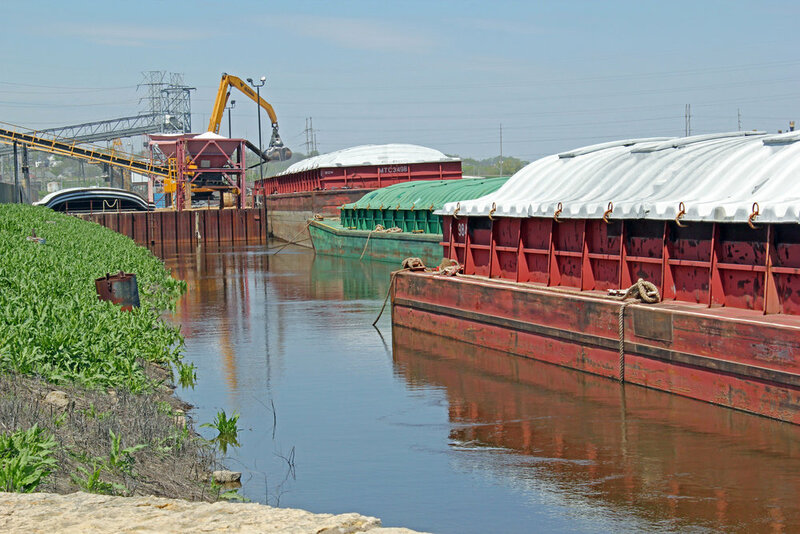 Need to Know: To access the docks, ask for the access code in the Port of Dubuque Marina (east end of museum building). Protect finished surfaces from paint. This site is easy to get to, but hard to find. Access across 151 from Arby's onto Jones Street, or from far west end of River Museum south on Ice Harbor Drive. Lots of old river town railroad and industrial scenes in this area. Restrooms: Half mile or so from Arby's and gas station. Space availability: Lots of room for artists to spread out. When John Deere decommissioned its power plant, the cooling water channel from the Mississippi was restored to marshland. Need to know: A walking/biking path leads to a trail end on the river - about a 10 minute walk. 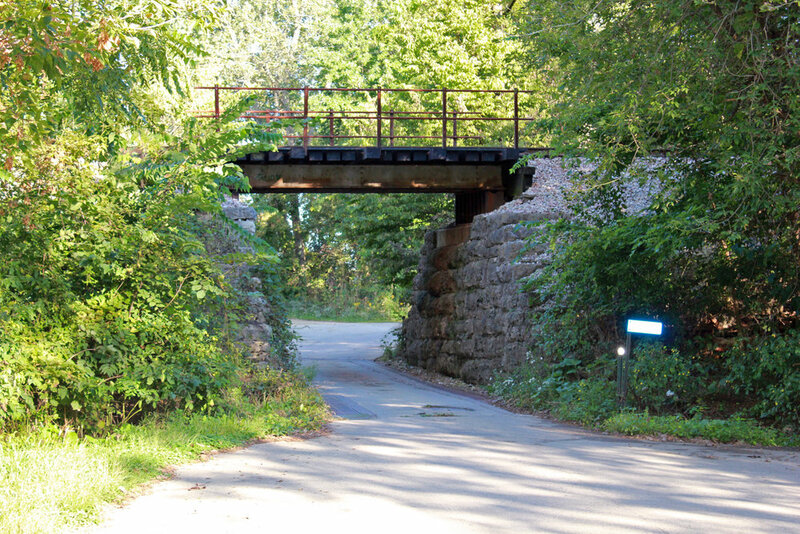 A path also forks off along the Little Maquoketa River where it enters the Mississippi. Bikes welcome. Setup Space: Lots near the parking lot. Limited at the trail end. Food: This location is a few miles from restaurants. 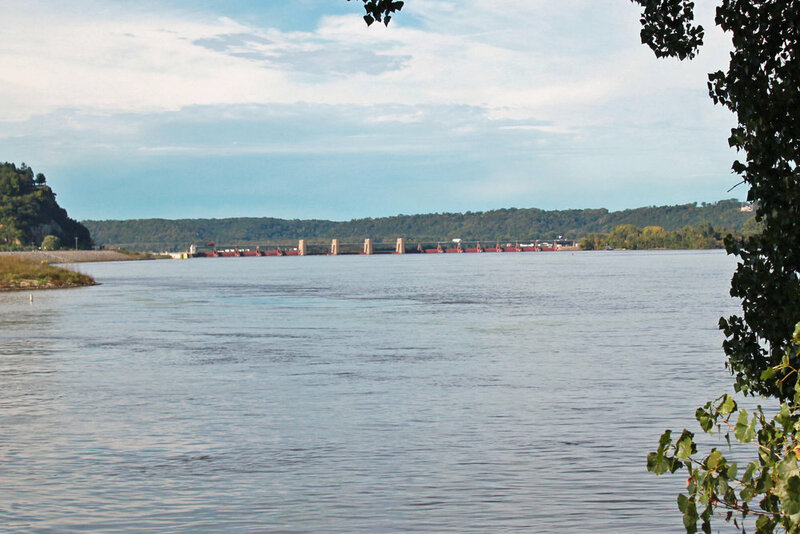 This park and campground offers up close settings on the river, as well as nice views north to the lock and dam and south under the Wisconsin bridge. This is be a favorite spot for Dubuquers to sit in cars and enjoy the views. Food: Restaurant in casino nearby. Also several fast food restaurants and convenience stores near intersection of Kerper and 11th Street. This relatively new park is more landscaped than natural. It offers an excellent view of the lock and dam to the north. Food: Near Dairy Queen and Yardarm. This is a small riverfront park off the road to Julien Dubuque's grave. Interesting RR overpass at the entrance. When you enter there is a dirt road to the left that offers a closeup view of the RR tracks along the bluffs.